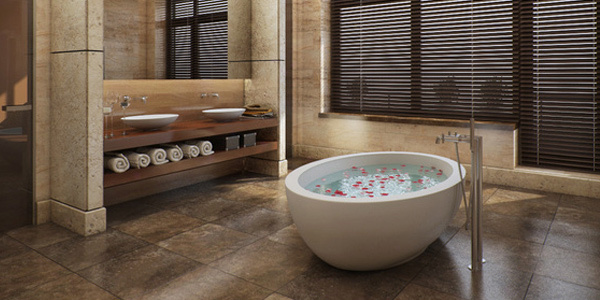 The bathroom is primarily a place in our homes where we take a bath and feel refreshed. 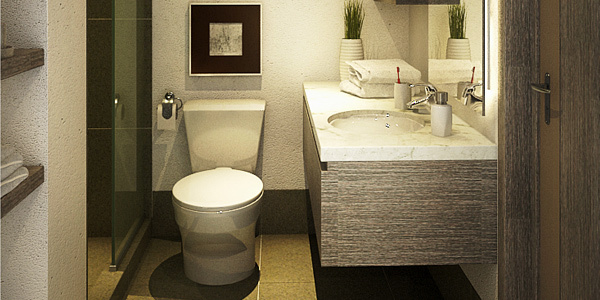 Most of the time a bathroom includes a toilet or a water closet. No doubt, this area is very important for us in order to feel comfortable and invigorated. Since we cannot just bath anywhere, it is important to have our own bathrooms in our house. Although, there are some commercial establishments that offer paid bathrooms and toilets, it is still preferable for many people to do that in their own homes. 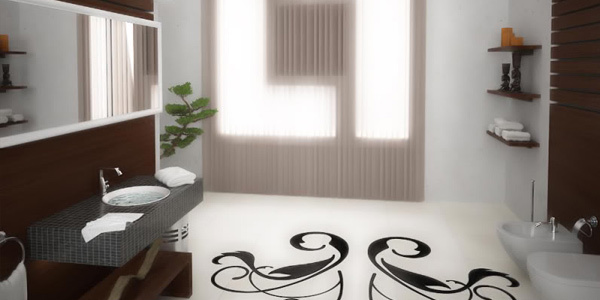 To have a good bathroom, it is important to consider some things in decorating and designing it. It is also vital to choose the right accessories, furniture and fixtures to make sure that you will have what you need in the room. 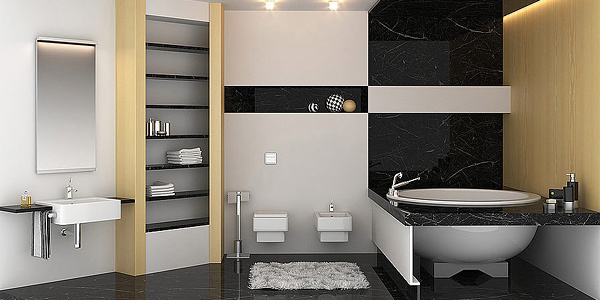 But if you really want to have that elegant looking bathroom that will certainly give you more than just comfort, then here are some tips to help you design your own bathroom. 1. Determine the primary user. Always plan according to the needs of the primary user. This is important so you will know what kind of materials and features you need. A bathroom for children and adult would have different needs and you would use different features, too. For a child’s bathroom, use non-skid surfaces and rounded edge to avoid injury. You can also place anti-slip mats. You can have adaptations for disabled persons by having grab rails to walls and close to the toilet. Consider a wall-hung sink so that people who use wheelchairs can move closer to it with ease. 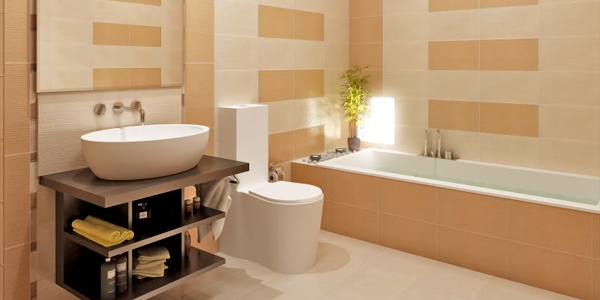 Sufficiency of space is important in order to allow comfort inside the bathroom. It wouldn’t be nice to enter a bathroom where you could hardly stand nor move. Allow space for sitting, standing, getting in and out of the bath tub or shower and enough traffic for moving around. You can use glass shelving for keeping your cosmetics and toiletries. 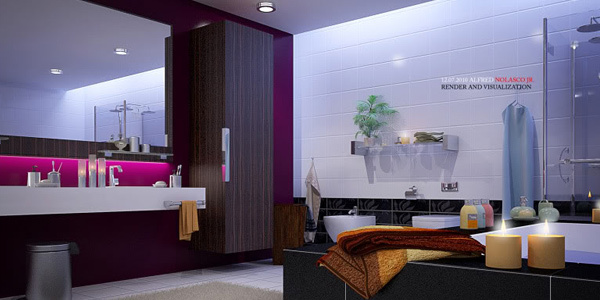 A good color scheme will help you enhance a small bathroom. You can also use curves in a linear room for it adds interest. 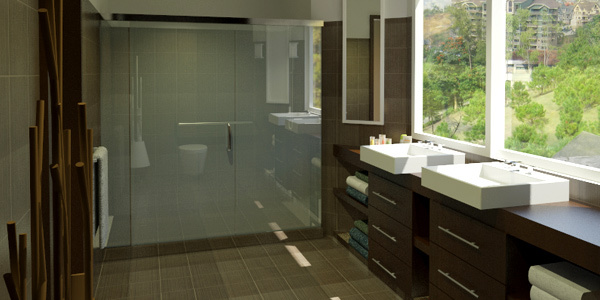 Use mirrors, windows and glass strategically for it creates a sense of openness allowing light to bounce throughout your entire bathroom. Some small bathrooms and washrooms have very high ceilings which gives the feeling of being boxed in. To avoid that, use slatted false ceilings with the right lighting. This can greatly help to enhance your bathroom. Use good decoration of your ceiling in order to make a better ambience inside the room. 4. Have smart storage spaces. If you don’t want to see clutter in your bathroom, have good storage spaces. You need to have storage areas for cleaning materials, medicines, children’s toys for the bathroom, toiletries and others. 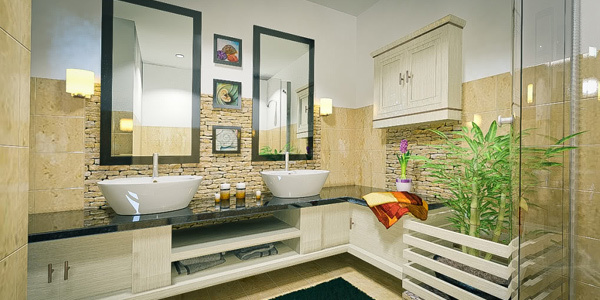 Choose a good bathroom vanity cabinet that will not only keep your toiletries but will also make your bathroom look good. You can have a cabinet that can occupy from floor to ceiling for a wider space. Windows can allow entry of natural light and air. But if you think your bathroom doesn’t have enough ventilation, you can consider using an extractor fan. You need to choose the right size for the fan and you can do this by getting the volume of your room. Your room volume will be multiplied by the number of air changes needed in an hour which is 20 for bathroom. Then you purchase a fan that is appropriate for your bathroom that could provide the needed flow rate of air. White is timeless for bathrooms. It looks very clean, fresh and would fit any style. Some use pastel colors and others use dark colors. Whatever color you use, just be sure that it complements each other and it will create a clean and inviting feel. The most important thing about bathrooms is cleanliness which is the reason why white is prominent as a color in bathrooms. You actually stick to white and just use some other colors to accent it. Use ceramic tiles for your flooring. It can create a tidy environment and it is easy to maintain. 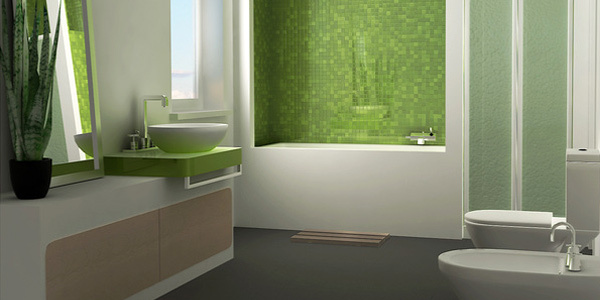 You can use part or full tiles in your bathroom. Use a different tile size for your wall and flooring. Since that are different sizes and designs of tiles, you can choose which one will fit your design. You can even choose a tile grout with a different color. You also have to choose the right bathroom accessories. Do not use too much of it for it might make your bathroom look too crowded. You also have to consider the design and style you want for your interior. You can have a soap dish, a tissue paper holder, a medicine cabinet, a toothbrush holder, a towel rail, and others. You can even put decorative jars, lights, plants, flowers, stones and others. To minimize space, you can use corner sinks, corner showers or corner baths. Choose the right size and style of sink. You may opt for a vanity unit, a pedestal a wall hung or an en-suite. Some bathrooms have a couch inside. You can actually use your creativity and choose the furniture to use that would suit your style. You can even use an antique dresser as your bathroom vanity. Choose the right size and shape for your bath tub and showers. Some even have saunas, whirlpool baths and spas. Make a unique look by customizing your bathroom. Also, consider concrete or limestone as surfacing material for a cool and clean look. Your bathroom fixtures greatly affect the look of your entire space. If we speak of lighting fixtures, you can use chrome lights which is commonly used in bathrooms. You may also choose for a bathroom mirror light that comes in different shapes and sizes. You can get different types of bathroom fixtures but you have to keep in mind four important things, the theme, the size, the comfort and the durability of the items. Choosing the right fixtures will increase the feel and appearance of your bathroom. There are actually so many ways to enhance the interior design of your bathroom. It is your choice of materials and furnishings that do the trick. But also, you need to consider your budget, too. Whatever you decide for your bathroom, for sure you’ll get that right if you have good planning before actually re-designing it. There are still more tips and design ideas that we will give you here at Home Design Lovers to make your homes look totally sumptuous!